Melanzane alla Parmigiana is a classic Italian dish of fried aubergines, tomato and parmesan, a bit like a lasagne but with aubergines instead of pasta. And it is delicious! Superior to lasagne in my opinion, if I had to choose between the two, melanzane would win hands down. It’s so hot today I have opened all the windows and there is a warm breeze blowing through the room. The weather puts me in the mood for a salad, and thinking about this dish gave me the idea of doing a salad version of it, with crispy aubergine slices, fresh tomatoes and shavings of parmesan. The thought of it has my mouth watering already..
To make crispy aubergine slices, you need to remove most of the water from the aubergine. It’s like a sponge, and holds a lot of moisture. Slice them and salt them to draw it out. This way they will go nice and crisp when you bake them. Heat the oven to 180C. Gently squeeze out the liquid from the aubergine slices, being careful not to break them. Arrange them on a baking tray and flatten them out. Sprinkle with a little black pepper, but no salt. Drizzle with olive oil and bake in the oven for about 15 minutes, turning them over halfway, until they are golden and crisp. Remove from the oven and leave to drain on some kitchen paper. To assemble the salad: slice the tomato into 2mm slices and season each slice with sea salt, cracked black pepper and olive oil. 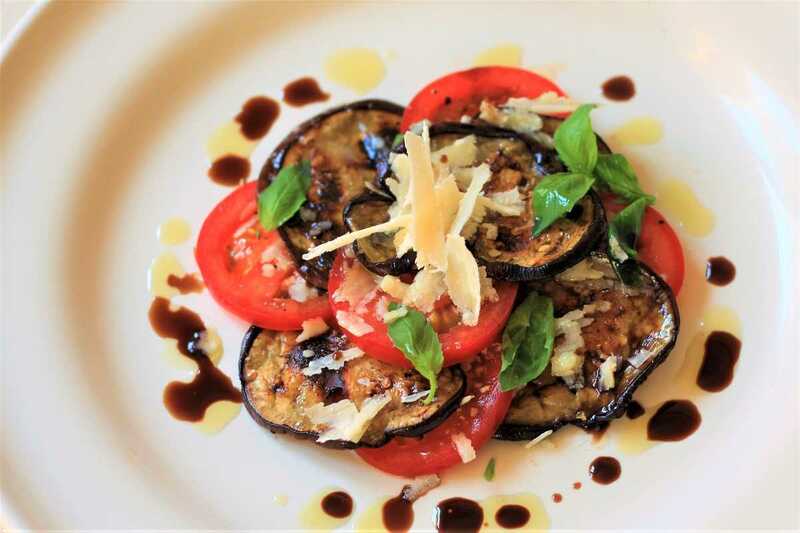 Arrange the aubergine slices alternating with the tomato as shown in the photo. Garnish with basil leaves, parmesan shavings and balsamic vinegar.